Salt was in use long before recorded history. In fact, animals instinctively forged trails to sources of salt to satisfy their needs. Early human hunters consumed salt by eating animal meat. As their diets changed to include vegetables and cereals, they discovered that salt, probably from sea water gave vegetables the same salty flavour as their meat. The scarcity of salt and high demand, kept the mineral precious. As civilisation spread, salt became one of the world’s main trading commodities. Salt routes developed across the globe. 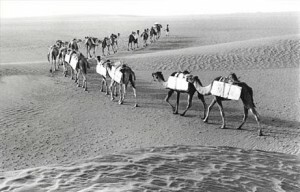 One of the most travelled routes was from Morocco, south across the Sahara to Timbuktu. Venice’s exceptional wealth is said to be as a result of salt trading. As early as the 6th century, in the sub-Sahara, merchants regularly traded salt ounce for ounce for gold. One of the earliest Roman roads was the Via Salaria (salt road), leading from Rome to the Adriatic Sea, where salt was gathered. A soldier’s pay, which was partly paid in salt, came to be known as solarium argentum, from which we derive the word salary. A soldier’s pay was cut if he “was not worth his salt,” a phrase that came into use because the Greeks and Romans often bought slaves with salt. During the Middle Ages, our relationship with salt become more superstitious. The spilling of salt was considered a bad omen. In Leonardo da Vinci’s painting ‘The Last Supper’,Judas is portrayed with an overturned saltcellar in front of him. After spilling salt, superstition says that the spiller should throw a pinch over the left shoulder because the left side is considered to be where evil spirits gather. Salt was taxed in England in the 18th century.” For centuries the French people were forced to buy all their salt from royal depots. During Louis XVI’s reign, the salt tax was so high that it helped to ignite the French Revolution. That’s just a brief history of salt, but there’s no doubt to how much salt has seasoned history.